Aren’t expectations incredible? We see the “experts” announcing the economy is losing steam because headline jobs numbers missed by 43K!! FUUGEDABOUDIT! The economy is alive and well and that includes the jobs market. 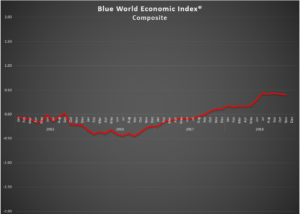 True, real estate is having some trouble but that has more to do with ill-advised Fed policy that may be slowed by this and some other data, but other than that the Blue World Economic Index® for November shows solid performance. Headline total was 155K but the Private Sector added 161K. The Labor Force and Total Employed grew. Total Unemployed was down and Not in Labor Force was essentially flat. The diffusion Indexes are still very high with the Total Private Sector at 58 and the 76 Manufacturing Industries just shy of 64! There was a net down revision to the last two months but not enough to overcome the prior. Wage growth is still sluggish, but we expect it to catch up eventually, probably by Q2 2019. Things are moving steady and strong. A little restraint from the Fed should feed Real Estate and don’t worry about trade wars. It may take a while to change learned behavior but they can’t hold out against the US for long. Have a Merry Christmas and Happy New Year. We’ll wrap up 2018 on Friday, January 4th with the release of the December jobs numbers. The economy is maintaining a high level of performance but there were definitely some notable pullbacks in November 2018. Leading that list was Real Estate which continues to take a drubbing at the hands of the Fed and their here-to-fore ill-advised advancement of rate policy. This past meeting offered some hope for a hold for a while. There was a bit of a mismatch in Wholesale Trade where the monthly inventory build outpaced sales but the year-on-year rate says more stocking is still needed. This would be less noticeable had it not been for the over sized contribution by Inventory to the latest GDP update. There was a hiccup in the Richmond Fed report which showed declines in Employment and New Orders components and that will need to be monitored. We obviously expect ebbs and flows in any economic conditions, but the shear strength of the current conditions makes any down blip noticeable. The fact is, however, the economy remains very strong and growing. Six of eight major categories remain in positive territory as Real Estate slipped ever so fractionally back into red ink. Hopefully some Fed restraint will help. Inflation remains the anchor of the negative column, but it did make a material move positive in November. Consumer, Employment, General Measures, Manufacturing, Retail and Services all remain very comfortably positive with Services leading the way at a whopping .84! Look for the Blue World Jobs Report out this Friday the 7th and Matt will break it down live on WBBM’s Noon Business Hour in Chicago at 12:09p Central, streaming, AM 780 and 105.9FM, and the Podcast will post later in the day.